Ok so I made this into Clickbait. But you really should read this and that has nothing to do with me being a co-author. The paper is “Ten questions concerning the microbiomes of buildings” and it is in “Building and Environment” a journal that I am becoming more and more appreciative of every month. The paper is to be #openaccess but still in the processing at the journal for that. So until then, here is a PDF of the paper. Adams RI, Bhangar S, Dannemiller KC, Eisen JA, Fierer N, Gilbert JA, Green JL, Marr LC, Miller SL, Siegel JA, Stephens B, Waring MS, Bibby K, Ten questions concerning the microbiomes of buildings, Building and Environment (2016), doi: 10.1016/j.buildenv.2016.09.001. Fig. 1. 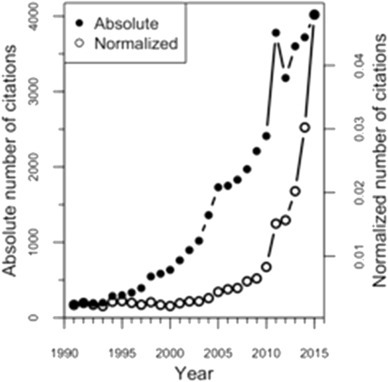 The absolute number of citations that are flagged in Google Scholar by the keywords: ‘microbiology OR microbiome OR bioaerosol AND indoor’ (left axis), and that number of citations normalized by ‘microbiology OR microbiome OR bioaerosol’ (right axis). In the paper, this group of authors basically asked and then answered a series of questions about microbiomes of the built environment. Q1) What does the microbiome of a typical indoor environment look like? Q2) How do building characteristics, including occupants and their behaviors, influence the indoor microbiome? Q3) How do moisture problems alter typical indoor microbiomes? Q4) How does the microbiome affect indoor chemistry, and how do chemical processes and the composition of building materials influence the indoor microbiome? Q5) What do DNA sequencing and modern analytical techniques tell us about the indoor environment? Q6) What are appropriate sampling methods and constraints for studies of the microbiology of the built environment? Q7) What technological developments will enhance our understanding of the microbiology of the built environment? Q8) What are the connections between indoor microbiomes and occupant health? Q9) What are the implications of recent work for building design and maintenance? Q10) What do all these recent studies NOT tell us? Lots and lots of information in here for people who want to learn about this field and related topics. I am a Professor at U. C. Davis. My lab is in the UC Davis Genome Center and I hold appointments in the Department of Medical Microbiology and Immunology in the School of Medicine and the Department of Evolution and Ecology in the College of Biological Sciences. My research focuses on the origin of novelty (how new processes and functions originate). To study this I focus on sequencing and analyzing genomes of organisms, especially microbes and using phylogenomic analysis (see my lab site here which has more information on lab activities). In addition to research, I am heavily involved in the Open Access publishing and Open Science movements.